Large tropical evergreen shrub. Large irregularly toothed and lobed leaves. The stems and leaves are slightly hairy. 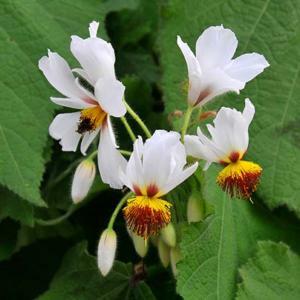 Clusters of attractive, 5-petalled, white flowers with prominent yellow and red stamens, which curiously spread out when touched. Moist, well drained, fertile soil in a sunny position. Tolerates shade. Best at temperatures of at least 15°C during the growing period, but a bit cooler during winter. When growing in a container as a houseplant or under glass, the size will be restricted and can be further controlled by pruning. Container grown plants can also be moved outside in summer. From cuttings, which strike quite easily. Also from seed. Conservatory or house plant, easy to grow.